Two super-sharp, backlit LCD screens offer a new approach to gaming. The possibilities are limitless - one screen can be used to show the main action, while another might be used as a map, inventory, or secondary viewpoint - or both screens can be used simultaneously to depict huge boss characters! The lower screen utilises Touch Screen technology for a true hands-on experience. 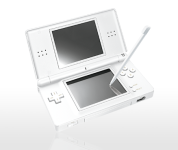 Draw pictures and send them to your friends with PictoChat, control the on-screen action with extra finesse, or navigate menus instantly at the touch of a fingertip. 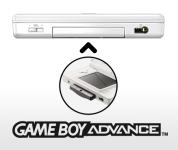 The system features two separate ports, one for DS Game Cards and one for Game Boy Advance Game Paks. The system is compatible with the GBA's entire back catalogue of games (playable in single player mode only). 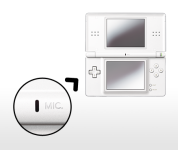 All systems feature a microphone port, allowing you to communicate with your friends in selected games, as well as interact with the game environment in brand-new ways!